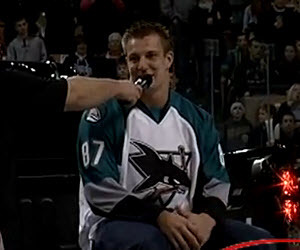 Our favorite Patriots tight end Rob Gronkowski made the trip out to Worcester last week to perform his famous spike move with a puck at the opening of the Worcester Sharks game. Though some of us still are wincing at the Patriots loss to New York poor Gronk did the best he could with his hurt ankle. Based on the video he has a positive attitude about the recovery of his foot surgery so we will all cross our fingers as we hope for return to the Super Bowl next year for the Patriots. Though the Sharks lost to the Providence Bruins that day there is still plenty of hockey to be played with a stretch of five home games starting next Tuesday March 6th. Check out the remaining schedule at the Sharks Website.